I flew out of Sydney on 10th June, a Friday night flight with China Southern, to Guangzhou. I caught a connecting flight to Chengdu the next morning, and took the airport bus (10 yuan) downtown. In the past I have usually stayed at the Traffic Hotel (now Mrs Panda Hostel) in Chengdu because of its proximity to the bus station for Kangding buses. 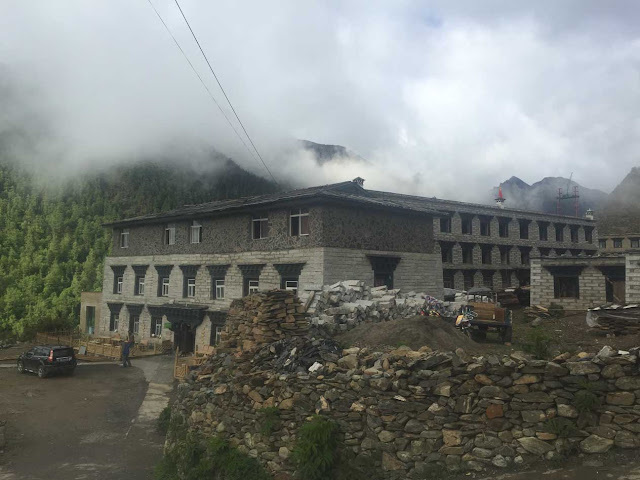 However, this time as I was flying into Daocheng, I stayed at a place called Flipflop Hostel, which was a really nice, friendly and efficient. The weather in Chengdu was hot and sunny and I was beginning to regret my choice of softshell pants and a merino wool base layer. However, I was later to find this was well justified in the wet and cold Tibetan highlands! Chengdu had changed a lot since my last visit five years ago. The Bank of China wasn't where it used to be - but fortunately there is now an efficient Metro system that took me to the new location, north of the Sports Stadium. In Chengdu I also bought a few odds and ends that I thought I might not be able to get in Daocheng - such as Nescafe. I faced he dilemma of not being able to take camping gas fuel on the flight - again, I needn't have worried - there is an outdoor shop in Daocheng's main square. On Sunday 12th June I got my 7am flight to Daocheng from the airport - but only after a last minute panic because it departed from Terminal 2, about 800m away from Terminal 1, where I was dropped off by taxi. I hadn't realised that the flight on Sichuan Airlines was to the highest airport in the world. Daocheng-Yading airport is at an altitude of something like 4400m, but it's not at all scary to fly in there - I have worse landings at Leeds Bradford airport. The flight was only about an hour, and we got great views of the Gongga Shan range on the way in. Landing on the Tibetan Plateau was a bit of an anticlimax - the airport is set amid a lot of tarns on a flat, rocky landscape about 40km north of Daocheng. There's nothing much at the airport except for a space-age terminal. Looks like they have only 1-2 flights per day. I had been worrying about having altitude sickness when I got off the plane, but didn't feel bad at all - perhaps thanks to the Diamox I had started taking two days earlier. On arrival at the airport I was met by a documentary maker for CCTV9, Qin Rey and his crew of camera and sound guys, namely Yue Qiang and Xiao Yu. 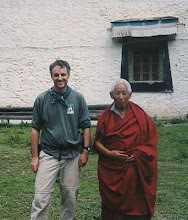 They are making a documantary of the Gongga Shan region and chose my trek in the footsteps of Joseph Rock as one of the topics for a programme. For the next eight days they would be filming me almost constantly. Qin Rey had a lot of useful local connections, and this meant he had already arranged some great accomodation in Riwa (now re-named Shangri-La). We stopped over in Daocheng to do a bit of last minute shopping. It had also changed a lot in the last six years - the main high street has been 'modernised' and the old guesthouses bulldozed. The centre of town now has a huge plaza, complete with statues of yaks. On the plus side, it also has an outdoor supplies shop - so if you are wanting to pick up supplies such as gas or gear this is obviously very handy. We drove over to Riwa and the weather wasn't looking great - overcast with a bit of light rain. In Riwa we stayed at a great guesthouse called the Four Seasons Lotus Inn - courtesy of the local government who were said to be very moved by my long term interest in their area! This was a pleasant surprise because the posh guesthouse usually costs around 600 a night. 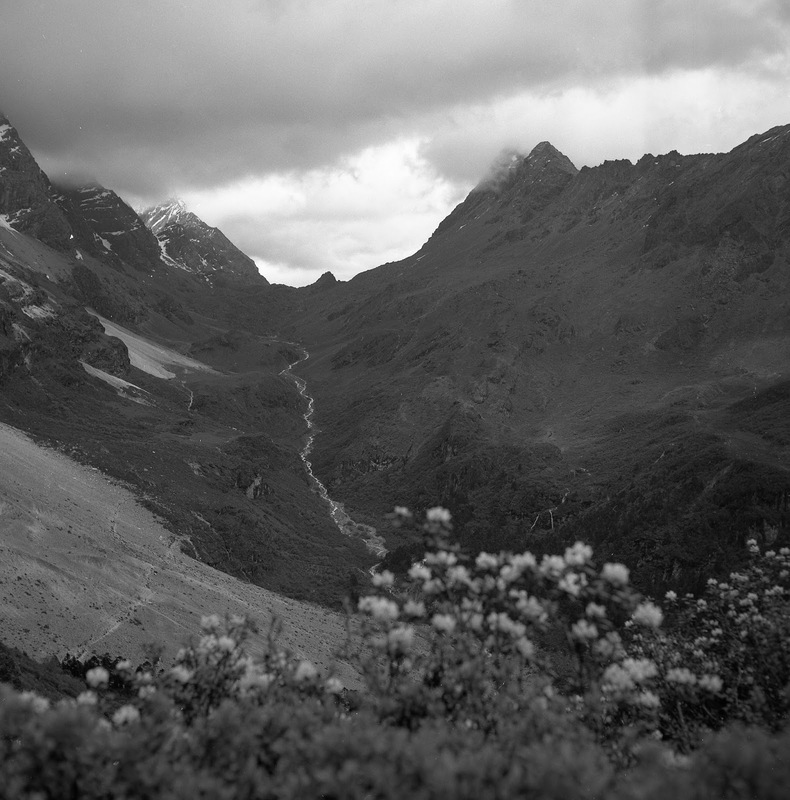 Qin Rey's connections also helped in getting into the Yading National Park. This usually costs a fortune - around Y280 - and you also have to take a special shuttle bus to Yading (again at high cost). However because of our inside track, we were able to drive in all the way to Yading in the Landcruiser. At Yading we stayed at one of the many guesthouses built in Tibetan style. Again, Yading has seen quite a bit of change since my last visit in 2010 - most of the old guesthouses have been upgraded and expanded, and some are really quite grand. I ended up sharing a room with our would-be Tibetan guide, Gong Que, who hails from Kangding. He looked like a real cowboy with his stetson-type hat and flamboyant silk waistcoat - but he proved to be a real joker and all round nice guy. The weather in Yading wasn't that great - low cloud and occasional showers. I was now glad I'd brought my wet weather gear and thermals because even in mid June it was quite chilly, especially after dark. There were huge numbers of Chinese tourists going up to Chonggu monastery on the concrete path - and all of them seemed to be kitted out for some serious walking: trekking poles, rainjackets, boots. A few were carrying canisters of oxygen. 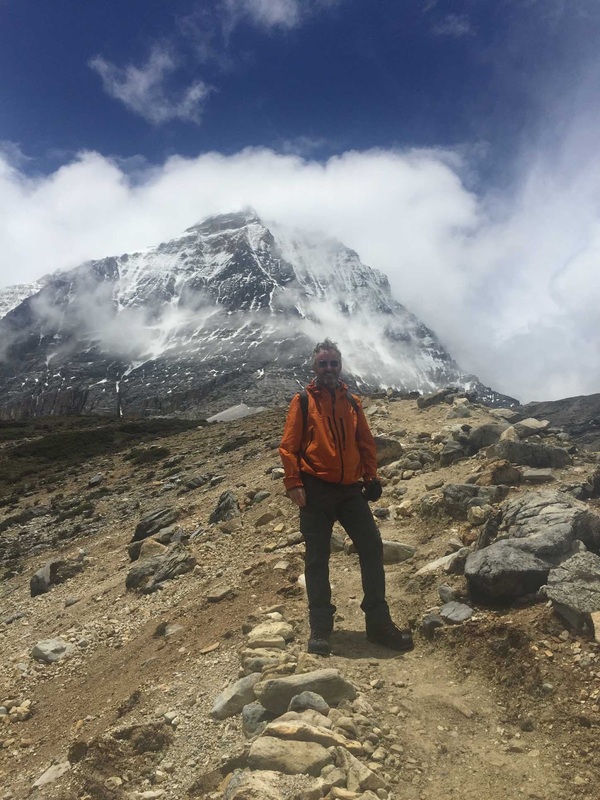 On my last trip I had found myself struggling to walk up even mild gradients at Yading, because of the altitude - but this time I felt OK. Again, maybe it was the Diamox - or perhaps all those evening training sessions I'd done, walking up and down the hills of Lane Cove with a 15kg pack on! 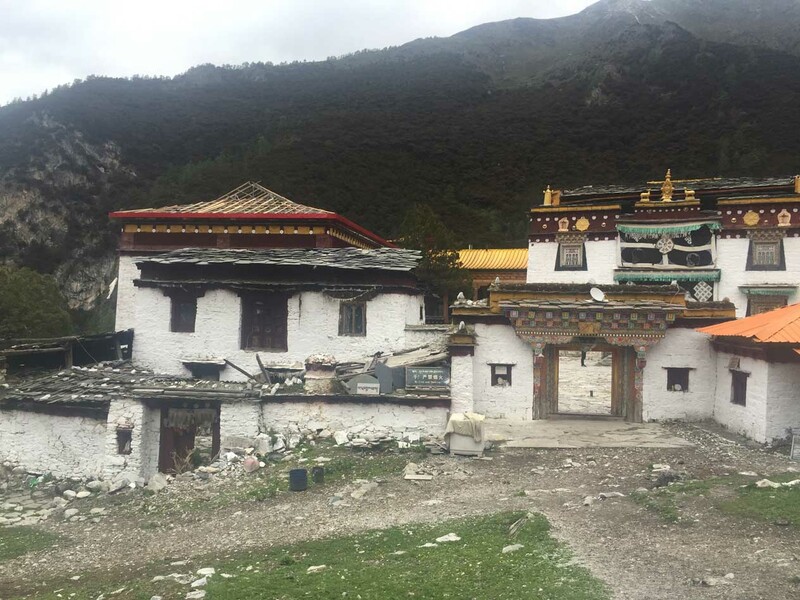 Chonggu Monastery was undergoing some serious extension and restoration work. A whole new wing was being built, and I hardly recognised the place from my first visit. The original prayer hall was still there, but now dwarfed by the new big buildings. Qin Rey and the TV guys organised an on camera 'interview' between and the new Living Buddha in the old prayer hall that I had visited in 1996. He was a smiley, ebullient guy who spoke rapid accented Mandarin that I could barely understand. He told me about the different deities who resided in each mountain. 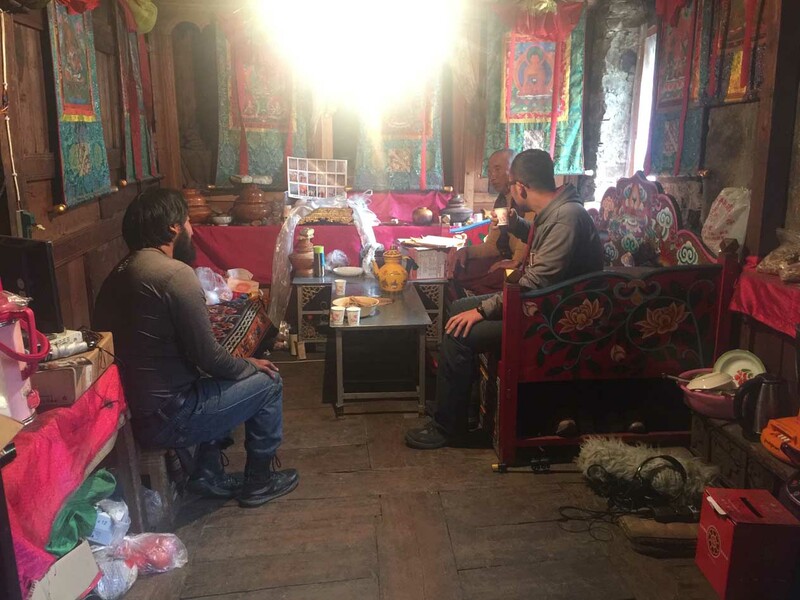 I asked him about the impact of mass tourism on the area, but he said this was not a problem - and he wished the local government would further open up the area to visits in the same way as Jiuzhaigou had one. Tourism had really improved the livelihoods of local people, he said, and there's no law in Buddhism that says you must stay in wretched backbreaking poverty, he added. After this bizarre interview was over we went up to the small lake, Zhuoma Tso, beneath Shenrezig. It's now all laid out with duckboards, from which you must not depart- strictly keep off the grass. There wasn't much of a view because of the low cloud - but there were huge numbers of people there taking photos. Back at the guesthouse I noticed that there was a young European woman staying there, but she seemed a bit cold and snooty. At dinner I saw her sat with a group from Shanghai, who explained they were from an advertising agency and had come to do a photo shoot for fur coats. The cold blonde was a Russian model who was not impressed by her surroundings or companions (she spoke no Chinese) and looked quite sulky. On our second Yading acclimatisation day we were up early and after a breakfast of pancakes, hard boiled egg and rice porridge, headed off up the Luorong valley on the electric buggies to go see Milk Lake (Niunai Hai) and Five Colours Lake (Wuse Hai). The weather was wet and gusty, but at least we got waved through for a free trip on the buggy - the CCTV connections working well again. I didn't find the walk up to the lakes particularly strenuous, but some of the others did. I employed my usual go-slow, walk-like-an-old-grandad pacing and managed to get up there without feeling too bad. The only problem was there were so many other tourists going up the muddy path and it was sometimes frustrating to have to linger behind a slow-moving group. It was also annoying to see so many people playing music out loud on their phones. So much for communing with nature. I just felt like I'd got into my stride when we reached the lakes - and decided to carry on up to the pass rather than hang around amid all the trinket sellers. So me and Gong Que left the young ones behind and continued up the gentle incline past the lakes, and made it to the Thee-Way Pass after about another half an hour. Must be over 4500m, but I still didn't feel I was taxing myself. We strode over to the other side of the pass where we had lunch looking down over the lake that Rock called Russo Tso and which locals told m is known as Lerxi Zuo in he local dialect.We would be coming past this lake in a week's time all being well - from the opposite direction. On the way back down we got a few exhilarating glimpses of Jambeyang and Shenrezig when the clouds parted. The weather was a mixture of rain squalls and gusty winds. My gear appeared to be keeping me dry - and everything seemed to be working OK, so the recce had been a success - time to go back to the guesthouse and prepare for the trek starting the next day! 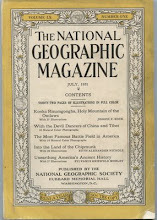 Hi michael, do you have any plan to visit Tebu area in near future?as I know,Rock had 3 times exploring in that area,and published articles on NG. 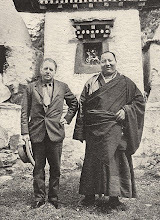 1927 March, he left choni for sichuan, through kachegou and dzhagana in tebu, it.s really an attractive area, kingdom of plants and wild animals. No plans to visit Tebu area at the moment - but it sounds like an interesting area!